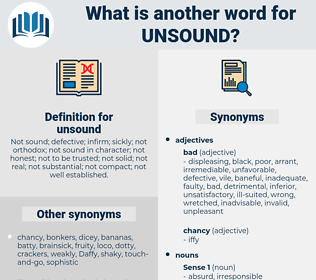 What is another word for unsound? Not sound; defective; infirm; sickly; not orthodox; not sound in character; not honest; not to be trusted; not solid; not real; not substantial; not compact; not well established. unfounded, inappropriate, unjustified, unjustifiable, undesirable, defective, wrong, groundless, imperfect, flimsy, precarious, questionable, dubious, fragile, weak, harmful, hazardous, unwarranted, inaccurate, unfair, deleterious, lame, pernicious, faulty, noxious. unhealthy, unreasonable, unreliable, unwise, unsatisfactory, irrational, inadequate, flawed, misguided, erroneous, deficient, incorrect, shaky, inadvisable, incomplete, mistaken, ill-advised, poor. just, true, certain, accurate, balanced, strong, well, sane, secure, steady, stable, protected, right, safe, correct, valid, firm, rational, reasonable, perfect, honest, reliable, sure, healthy. reasoned, dependable, justified, able-bodied, wise, factual, exact, convincing, flourishing, good, well-founded, blooming, credible, validated, hardy, cured, sober, corroborated, impeccable, errorless, organized, better, conditioned, informed, recovering, tested, proper, plausible, letter-perfect, judicious, chipper, unneurotic, substantiated, compelling, enlightened, clear, rugged, logical, bouncing, rehabilitated, improved, commonsense, thriving, lusty, precise, satisfying, hale, mending, confirmed, fit, robust, wholesome, normal, faultless, proven, established, well-grounded, healthful, whole, lucid, flush, well-adjusted, cogent, tough, persuasive, hearty, flawless, well-conditioned, veracious, sensible, stalwart, ordered, demonstrated. You know well enough that I have told you this, - in more civil language it may be, - again and again; and I hope that the telling of it now, flatly, will induce you to consider the immense responsibility that lies on your shoulders; for there are other ships belonging to your firm in much the same condition - ships with inferior charts and instruments, unsound spars, not enough of boats, and with anchors and chains scarce powerful enough to hold a Deal lugger in a moderate gale. His religion may indeed be mistaken; it may be defective; it may even be unsound; but the chances are very much in favor of its not being insincere.